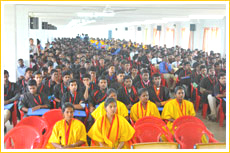 The Kavery Institutions can boast of having one of the best alumni associations having formed the Kavery Institutions college alumni federation as early as 2010. The institution was established in 2006 and has given the best engineers and entrepreneurs who have not only contributed immensely to the industrial and economic development of the world but also pioneered the cause of technical education and engineering in India. The architects of some of the finest engineering industries in India have been associated with TKEI. This website is a tribute to achievements of these great personalities. It is a forum for every kaverians to relieve the memories of his/her days in TKEI, foster a bond with his/her Almamater and get involved personally with the growth and development of this grant institution. This web site will be their window to the academic and research world, they once belonged to. The news, the views, the events, the happenings, the achievements on and off campus would be posted here. Alumni could establish links with their friends and batch mates and exchange news. It’s one huge family reunion.